An uninvited guest has been caught hitching a ride on the International Space Station, and it's a worrying one. JPL-NASA Scientists have identified strains of Enterobacter collected from the space station's toilet and exercise area. If you've heard of the genus before, it's probably in relation to hospitals. Some Enterobacter strains can infect immunocompromised patients in intensive care wards - and they have high resistance to antibiotics. 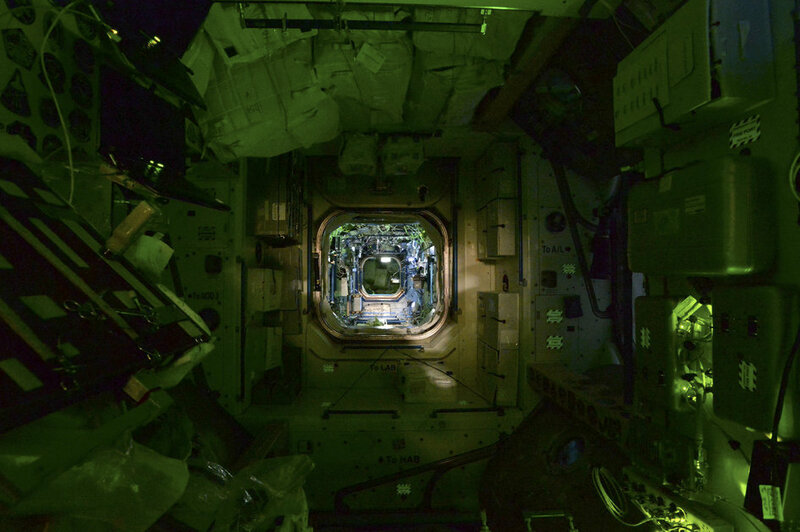 Luckily, the strains of Enterobacter found on the ISS were strains that aren't pathogenic to humans, but the fact that there were any strains of Enterobacter on the station at all could have worrying implications. Human bodies are positively teeming with (beneficial) microbes. We trail them wherever we go; and, even using our best sterilisation methods, we can't entirely eradicate them on spacecraft in clean rooms. So it would be incredibly surprising if there weren't any at all aboard the International Space Station. But it's an environment unlike any found on Earth. There's microgravity, there's space radiation, there are elevated carbon dioxide levels, and there's the constant presence of humans, all of which could affect the way microbes live and propagate. Microbiologists with NASA's Jet Propulsion Laboratory regularly analyse microbe samples collected from the space station to see if the space environment affects their populations in any way - and also to see if they are posing a hazard either to the health of the astronauts, or the delicate equipment. But this is the first time they've identified antibiotic-resistant Enterobacter strains up there. "To show which species of the bacteria were present on the ISS, we used various methods to characterise their genomes in detail. We revealed that genomes of the five ISS Enterobacter strains were genetically most similar to three strains newly found on Earth," explained microbioligist Kasthuri Venkateswaran. "These three strains belonged to one species of the bacteria, called Enterobacter bugandensis, which had been found to cause disease in neonates and a compromised patient, who were admitted to three different hospitals (in east Africa, Washington state and Colorado)." The samples were collected in 2015, and no astronauts have been struck down by an Enterobacter, so the microbes don't seem to be an immediate danger. They also found that, while the space station Enterobacter strains aren't currently human-pathogenic, they have 112 genes in common with the clinical strains, associated with virulence, disease and defense. "Whether or not an opportunistic pathogen like E. bugandensis causes disease and how much of a threat it is, depends on a variety of factors, including environmental ones," Venkateswaran said. "Further in vivo studies are needed to discern the impact that conditions on the ISS, such as microgravity, other space, and spacecraft-related factors, may have on pathogenicity and virulence." The team's research has been published in the journal BMC Microbiology.